Rajdeep Sardesai in conversation with Ravish Kumar. Vaihayasi Pande Daniel/Rediff.com listens in. The ovation he received when he walked into the Tata Theatre, south Mumbai, protected by bodyguards, last fortnight, was especially enthusiastic. Some even got up onto their feet to welcome him, clapping continuously. Had Amitabh Bachchan walked in, you wondered? But you would be forgiven for mistaking the new arrival for a superstar. He received probably a warmer reception than any other guest speaker attending the Tata Live Literature Fest at the National Centre for Performing Arts, Nariman Point. That's the effect NDTV India Anchor Ravish Kumar has on a crowd, you discovered. During the conversation he had with India Today Anchor Rajdeep Sardesai -- that spilled way past the designated one hour -- every few sentences he spoke were finished off for him by the audience's applause of approval or peals of laughter. The topic under discussion was titled The Free Voice -- which is also, incidentally, the name of Ravish's recent book, that was translated from Hindi -- and the two outspoken television personalities proceeded to examine, no holds barred, the true state of free expression and individual liberties in the country today. Mumbai boy Rajdeep doesn't own too much shudh Hindi and prefaced the dialogue with the announcement that he would be conversing in Hindi with Ravish, who usually only speaks in Hindi. Rajdeep told Ravish proudly that his Hindi "सुधर गयी आप जैसे लोगों के साथ बैठने के बाद! (improved after sitting with people like you!)" Ravish, smiling, offered a quiet "काफी सुधर गयी! (improved dramatically!)" Both laughed heartily at that. Ravish, 43, whose full name is Ravish Kumar Pandey and hails from Motihari, close to Patna, and has now lived in Delhi for the past many years, ever since he moved there for higher studies, spoke in very spasht (clean) Hindi, with just a tiny Bihari lilt. His language is powerful, which accounted for the crowd response. It is also sober, devoid of excessive hyperbole. The measured, plain speaking gets his point across. As does the dry wit. Though the topic was slightly ominously titled -- the subtitle referred to the free voice being under threat -- and perhaps reflected a serious concern in today's India, particularly in our online territories like Desi Twitterdom etc, Rajdeep and Ravish didn't lose their sense of humour, often making quips about the present Dilli dispensation, that the people in the room lapped up. Introducing him, Rajdeep said: "I believe he represents a voice in the media that is unfortunately is all too rare. The voice of what I call the Real India... So if the nation really wants to know something they should turn to Ravish!" The preacher remark was apt -- Ravish, 43, wearing a russet cardigan, a light purple shirt, brown slacks, glasses, with his overlong grey hair and calm serious face, radiates a kind of default air of saintliness. Rajdeep kicked off the session talking of the dark hole the media had found itself and how after all these years the tables had turned and today the reporter was sadly the story. He asked Ravish grimly: "आज रविश आपके साथ सिक्योरिटी गार्ड्स है... आप अपना आवाज़ बुलंद करना चाहते हैं, और अगर कोई व्यक्ति अपना आवाज़ बुलंद करना चाहता है (Today, Ravish there are security guards with you. If you want to raise your voice or anyone wants to raise their voice)... You can be targeted... You face physical danger today of the kind which did not exist maybe 10 to 15 years ago." Did he agree that the reporter was now the story? Ravish: "पहले तो रिपोर्टर का इंस्टीट्यूशन ही खत्म हो गया है टेलीविज़न से, रिपोर्टर नाम का इंस्टीट्यूशन तो अब है ही नहीं (Firstly, the reporter as an institution is finished on television, there is nothing like a reporter on television any more.)" In his reply he further explained that the reporter had become the news because ever since "हमारे आदरणीय प्रधान मंत्री (our respected prime minister)" Narendra Damodardas Modi came to power and the news started getting blacked out, in what he termed a very organised manner by his troll sena: "खबर ही नहीं है (There isn't any news)." He added: "कोई भी, जिसकी सम्भावना है कि क्रिटिकल है, कभी question कर सकते हैं रास्ते में चलते चलते उसको सोशली, पॉलिटिकली एलिनेट किये जा रहा है (If there is anyone, who might be critical or at some point question the current regime, attempts will be made to alienate him socially and politically)." Ravish, who receives threats regularly on the telephone and his contact details posted on the Internet for people to abuse him, described, baldly, the kind of misplaced antagonism he also faced on a day-to-day basis: "धमकिया तो हम लोगों को आती रहती है, जाती रहती है (लेकिन) यह (मोदी) बहुत ही आइसोलेशन का लीडर है आप कोई जगह में लिफ्ट से उतर रहे है, और चार आदमी कह रहे हैं आप मोदीजी का नुकसान क्यों कर रहे है? (Getting threats is routine. But this Modi is a leader of isolation. You might be going down in the lift somewhere and four people will tell you 'Why are you trying to hurt Modi?')" "दिवाली पार्टी में जाते हैं, दो आदमी झगडने चले आते हैं, मोदीजी का आलोचना क्यों करते है? (At a Diwali party a couple of people come to fight with me saying 'Why are you criticising Modiji?')" "मॉल में जा रहे है, बच्चों के साथ, खाना खा रहे है, कोई आके कह रहे हैं बच्चों को अपने पिताजी से बोल दो इस सरकार की आलोचना कम करने के लिए (I am at a mall with my kids and we are having a meal and someone comes and tells my kids 'Tell your father to lessen his criticism of the Modi government')." "हमारे ज़िन्दगी में ये कौन लोग बोल रहे है? और उनका एंटाइटलमेंट कहाँ से आया? उसे नरेंद्र मोदी से आया (Who are these people interfering in my life? Where did they get the right to do so? They got it from Narendra Modi)." Rajdeep had his own story of being approached by a group of people while eating at an Udipi restaurant in the upscale Richmond area of Bengaluru in May, while covering the Karnataka elections. But he noted that no one else in the restaurant said anything or supported him. And he wondered why "लोग शांत क्यों है? (Why are people quiet?)" Ravish further recounted how he went over to his sister's home recently for the festival of Chhath, a neighborhood youth came over. "एक लड़का आया बीस-चौबीस साल का और कहा था 'आप एंटी-नेशनल है?' (A young man of around 20-24 years came up to me and told me 'You are anti-national')" like Ravish belonged to some special new class or breed. That illustrated to him the isolation that had become routine in Modi's India for those who spoke out against the government. Ravish called it "normalisation" -- the normalisation of classifying differing voices as 'anti-national', 'urban Naxal' etc; the normalisation of hate. Rajdeep supplemented that view, later, explaining it was also the normalisation of the 'them vs us' social binary. Analysing the brainwashing of the public Ravish said "(वोटर को) लगातार एक नैरेटिव में उसको रखा गया। उसका करैक्टर बदलने की कोशिश की गयी. बताया गया कि आप ही सरकार हैं। आप देखो कि कोई हमारा आलोचना नहीं कर रहा है (The Indian voter has been regularly kept hostage by a narrative that attempts to change his character. They have been told they are the government and that they need to look around and see that no one criticises 'us')." He said this narrative had been building ever since Modi -- "२०१४ जैसे पावर हाथ में आता है (ever since he got power in his hands in 2014)" -- and he stopped giving anymore interviews on television and quickly ended the avenues of contact the press had with the PM and the PMO, even stopping journalists from travelling with him. "वहीँ से प्रेस को खत्म कर दिया गया। और प्रेस ने एक्सेप्ट किया है, 'यह बड़ी अच्छी बात है कि उन्होंने सब को हटा दिया' (From that point on the press was finished. And the press accepted it, 'This is a good thing that they got everyone out')." Ravish, whose arguments are appealingly logical, declared, that was tantamount to the US president disposing of the entire White House press corps: "हिंदुस्तान होता तो कहा जाता कि व्हाइट हाउस में ये जर्नलिस्ट कर ही क्या रहे है? इन सब को भगा देना चाहिए। हर जगह से वौइस् एलिमिनेशन उस २०१४, २०१५ और २०१६ (के साल में हुआ) (If it was India, they would have said what are these journalists doing in the White House? Throw them out. From everywhere voice elimination happened in 2014, 2015 and 2016)..."
"अभी आपको थोड़ी बहुत शांति इस लिए दिख रही है (क्योंकि) कहा गया है सबको कि अभी चुनाव में अपने कार्यक्रम या उपलब्धियों का प्रोपेगंडा करना है, बहुत नेगेटिव हो गया है इस लिए चुप रहना है... इस लिए आपको कुछ ६ महीने से चेंज दिख रहा होगा तब स्टोरी आ जाएगी कि कैसे प्रधान मंत्री ने सबको रेन-इन किया है, और सब को शांत किया लेकिन ये सब इशारे पर ही चल रहा था (If you can see there is a little bit of calm now it is because everyone has been told that for the elections do propaganda about your achievements. There is too much negativity about. So be quiet. That is why you can see some change for the last six months... Then a story will come how the prime minister reined in everyone and silenced them all, but this was all done (from the start) with the the subtle signalling of someone)." 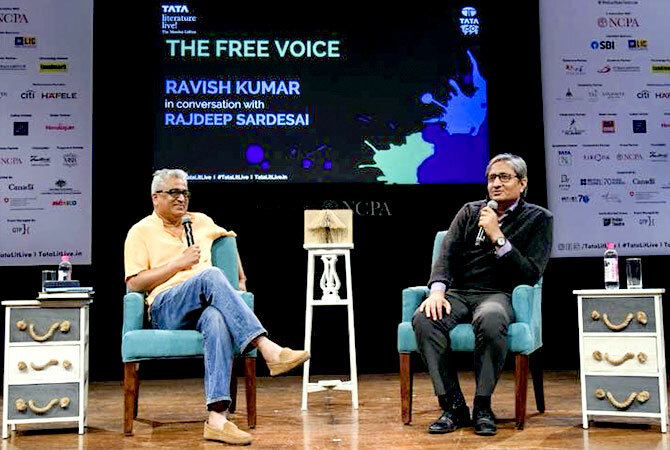 The conversation turned to Ravish's assertion, that he brings out in his book The Free Voice, that a WhatsApp University had been established in India that aided 'truth decay' -- where folks were happy to get their learning from WhatsApp alone and the medium had caused: "थिंकिंग की रिफरेन्स पॉइंट को ही बदल दिया है (They have changed the reference point of the thinking of people)." He explained: "जब आप जेएनयू का इवेंट हुआ, तो तब आप सिर्फ जेएनयू.देख रहे थे। लेकिन तब आप नहीं देख रहे थे की व्हात्सप्प के ज़रिये, देशके गांव-गांव में जेएनयू के बारे में किस तरह की नैरेटिव फैलाई जा रहीं थी (When the JNU event happened then you only saw news about JNU. But you didn't know about the kind of narrative that was being spread, through WhatsApp, to every village in the country)." "As a media person, आपके पास चाहे जितने भी फैक्ट्स हो, जितनी भी आपकी तैयारी हो आपका मेन चैलेंज जो है, यह है की व्हात्सप्प यूनिवर्सिटी से जो नैरेटिव बना है। तो क्या आप (as a media person) उस वाल को तोड़ सकते है? आप उस वाल को इतनी आसानी से नहीं तोड़ सकते है (No matter how many facts you have (at your fingertips), no matter how ready you are Your main challenge is that the narrative has already been created through the Whatsapp University. Can you as a media person break that wall? You will not be able to break that wall so easily)." Referring to the 2016 JNU incident when student leaders like Kanhaiya Kumar were arrested and charged with sedition, Ravish asked the room softly: "आज़ादी, यह कोई शब्द थोड़ी है। इस शब्द को हमने १५० साल के लिए लड़ा है। डेढ़ सौ साल तक लड़ा है। सुन्दरतम शब्द में से एक था!... (Freedom or azaadi is not just a word. We have fought for this word for 150 years. For upto 150 years! Then azaadi was one of the best/prettiest words!)..." His next words are drowned out by brisk applause. "चाहे वो तिलक कह रहे है, चाहे नेहरू कह रहे है, चाहे गांधी कह रहे है, या कोई भी कह रहे है, या भगत सिंह कह रहे हो... ये सुन्दरतम शब्दों में से था … लेकिन इस शब्द की लेजिटिमेसी किस तरह से कुचली गयी । कुचली गयी की नहीं कुचली गयी जेएनयू के बहाने आज़ादी शब्द की लेजिटिमेसी कुचली गयी। और उसको एक बदनाम शब्द बनाया गया। और लोग नार्मल होते गए (Whether it was Tilak saying it, whether it was Nehru saying it, whether it was Gandhi saying it, whether it was Bhagat Singh saying it, it was one of those words that inspired people. But the legitimacy of this word has now been crushed. Hasn't it been crushed or not? Using JNU as an excuse, the legitimacy of the word azaadi has been crushed. It has been transformed into a bad word. And people found that normal too)." Quoting figures that BJP President Amit Anilchandra Shah offered some time ago while on the campaign trail, that Uttar Pradesh alone has 2.6 million WhatsApp groups, Ravish asked the audience to understand what that meant and how many more WhatsApp groups there were in operation in other states across the country. "अगर उत्तर प्रदेश में बत्तीस लाख व्हाट्सप्प ग्रुप हो, और यह कोई साधारण ग्रुप नहीं है। उनके साथ पोलिटिकल पार्टी का एंटाइटलमेंट है, पावर का सपोर्ट है, यह क्या कर सकते है आपको अंदाजा नहीं है! (If there are 32 lakh WhatsApp groups in Uttar Pradesh (alone), and these are not normal groups -- they have the support of a political party, they have the support of power. You can’t even imagine what they can do!)" "रोज़ कुछ न कुछ कर रहे है। इस व्हात्सप्प में गांधीजी की हत्या को लेकर जस्टिफाई करने के लिए जितनी हाई-स्किल्ड कवितायें लिखी गयी है और जिस तरह हिस्ट्री की नैरेटिव गढ़े गए, रोज गढ़े जा रहे है... और उसको लाखो-करोड़ों की संख्या में लोग पढ़ रहे है आप के सच कहने का या झूठ कहने से उसको कोई फर्क नहीं पड़ने वाला है, क्योंकि उसको यह पता हो गया है, पिछले चार साल में, गांधी की हत्या बहुत जायज (legitimate) थी, ठीक भी थी... (Every day something or the other is happening on WhatsApp. Through this WhatsApp so much appealing poetry has been written to justify the killing of Gandhiji. And a new narrative of history is being created. Every day it is being created!. And lakhs and crores of people are reading it every day. You might be speaking the truth or a lie but it makes no difference, because over the last four years, they have been made to believe Gandhi's assassination was legitimate and it was fine)..."
Ravish pointed out that while this kind of talk began on the lowest common denominator mediums, they finally found their way into the speeches of the BJP's top brass. "मैं एक नया ट्रेंड देख रहा हूँ की जब कोई शब्द या कांसेप्ट व्हाट्सप्प के ज़रिये, या ट्विटर के ज़रिये फैल जाता है, तो उसको ऊपर वाला आवाज़ देता (like) अर्बन नक्सल... इसकी sanctity कहाँ से है?... (I have seen a new trend. Whenever a new word or concept spreads through WhatsApp or Twitter, then the people in power also, eventually, begin to say it too, like Urban Naxal. Where did this word get its sanctity?)..." "यही मटेरियल,यहीं शब्द आपको (UP) मुख्यमंत्री योगी (Ajay Singh Bisht) की ज़बान में मिल जायेगा।आपको अमित शाह के ज़बान में मिल जायेगा। आपको प्रधान मंत्री के इंटरव्यू में मिल जायेगा। और यहीं भाषा जो फैलायी गयी चार साल से, वह (BJP spokesperson Dr) संबित पात्रा के ज़बान से निकलेगा (This material, these words you will find in the speeches/conversation of the UP chief minister, you will find in the Amit Shah's speeches/conversation, you will find it in the interviews of the prime minister. And this language, which has been spread for the last four years, will finally also come out from BJP spokesperson Sambit Patra's mouth)." The language of debate being circulated initially of WhatsApp, later on television and in political speeches, he said, was loaded with violence -- 'और यह रोज़ घरों में पहुंच रही है। न तो यह बोलने का तरीका किसी बाप का है, न बच्चे का है, न माँ का है, न दादा का है (And this is reaching every home in India daily. This is neither the style of speaking of someone's father or someone's child or someone's mother or someone's grandfather)." Ravish told the room that if they still didn't believe him, he could prove that the continuity of that language was not accidental. His additional worry, he said, was that youngsters could get radicalised and act out in some reckless manner that would unnecessarily endanger themselves. A member of the audience murmured: "बहुत सही बहुत सही बहुत सही (Very correct. Very correct. Very correct)." Rajdeep added in agreement that this kind of language was being "sanctified" top down. "The PM has openly called journalists news traders. 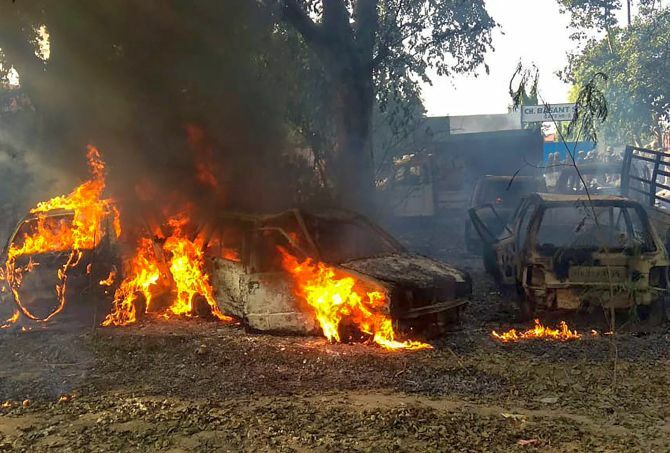 Openly used the words 'urban Naxals' to describe in Chhattisgarh anyone who opposes the government... There is a trajectory of constantly looking for the enemy. आज का दुश्मन कौन? आज मुझे बताओ आज का दुश्मन कौन? कौन है आज का दुश्मन? कौन है वह देशद्रोही? कौन है वह एंटी-नेशनल?! (Who is today's enemy? Tell me who is today's enemy? Who is today's enemy? Who is that traitor? Who is that anti-national?!)" Ravish said this kind of propaganda was not emerging from the mouths of just stray fringe elements. Giving the example of the controversy over whether Bhagat Singh had been visited in jail by Congress leaders (Nehru actually did), he said finally Modi raised it too. "WhatsApp university ka bhasha (language) and the political class bhasha is the same. There is a way in which he gives WhatsApp University legitimacy... आप (to Modi) फाइल्स नहीं पढ्पाते होंगे आप भगत सिंह का हिस्ट्री क़ब पढ़ते है? (You won't be able to be looking at files (to Modi)... When do you study the history of Bhagat Singh?)" History was a particularly favourite tool. Historical topics and controversies were being willy-nilly introduced for debate via a variety of mediums. "Why are they attacking history?" Ravish asked. "हमारे nationhood ka reference point क्या है, राजदीप? आज़ादी की लड़ाई... (अगर) इस तरह से घसीट घसीट के ख़त्म कर दो की लग रहा हो की आज़ादी के लिए नहीं लड़ रहे थे (What is the reference point for our nationhood, Rajdeep? The fight for freedom. If it is being damaged in this manner, people will not think we even fought for azaadi)." He said his biggest fear was that they might heavily appropriate Gandhi after Patel: "में तो डरा हूँ कहीं गांधी की मूर्ति ऊँचा न बनाये (I am scared they will build a way too tall statue of Gandhi). He was a lovable as he was, a small man. What if they build a 500-foot statue of him?!" Harking back to the normalisation phenomenon, Ravish, his voice getting louder, its cadence changing, directed the spotlight to an issue which he said was the most shameful: "नार्मल हो चुके हैं कि हिंदुस्तान में १५-२० करोड़ की आबादी है मुसलमानो की, उसको कोई रिप्रजेंटेशन ही नहीं देता है। हम नार्मल हो गये हैं। ये शर्म आनी चाहिए, हमारे लोकतंत्र को! (It has become normal that Muslims in India, who have a population of 15, 20 crores, don't have any representation. We have made that normal. As a democratic country we should be ashamed of this!)" Rajdeep, who covered the Madhya Pradesh election campaign, added that both the BJP and Congress were not giving tickets to Muslims and this was an election in which the least number of tickets had been given to that community. Ravish: "यह डरावनी बात है, राजदीप। वैसे ही हमारे लोक सभा और विधान सभा में सांसद और विधायकों की हैसियत समाप्त हो चुकी है क्योंकि वहां नाम के लिए भी कोई मुस्लिम नहीं है और हम लोग ने नार्मल एक्सेप्ट किया है की मुसलमान का चुनाव लड़ना (पॉसिबल नहीं है) उसको चुनाव की प्रक्रिया से हमने बाहर कर दिया... दरअसल अब ये चुनाव ८० करोड़-९० करोड़ हिंदुओं का हो रहा है. ये हिन्दू चुनाव है. २० करोड़ मुस्लिम को लोगों ने पोलिटिकल सिस्टम से बाहर कर दिया है इसीलिए हमको इस से नार्मल नहीं होना है... इसका एक प्रोसेस होता है (This is scary, Rajdeep. Already our representation in Lok Sabha and the Vidhan Sabhas is skewed because there are no worthy Muslims there. We accepted that it is normal that Muslims can't fight elections. We have kept them out of the election process. Actually this election is now between 80 and 90 crore Hindus, this is a Hindu election. 20 crore Muslims have been kept out of the political system. We can not allow this to be considered normal. It becomes a process). Even the Muslims begin to normalise it and stay away from elections." Ravish also spoke -- with Rajdeep adding his heft -- on the spate of lynchings of Muslims and how it was now also "normal" for citizens to not feel anything for these murders or the fact that Union Minister Jayant Sinha draped tricolour scarves on the accused. "(दादरी लिंचिंग के मोहम्मद) अख़लाक़ और पहलु खान (in Alwar by cow vigilante groups) के मारे जाने का कोई अफ़सोस नहीं है। कोई बात नहीं । उसके लिए तो होना चाहिए जो अख़लाक़ और पहलु को मारने आये थे? वह तो आपके हिन्दू थे। तोह क्या आपको मंजूर है कि एक पहलु के लिए बीस हिन्दू हत्यारा बना दिया जाये? वह भी नहीं सोचेंगे?! (There is no remorse over the Dadri lynching of Mohammad Akhlaq or of Pehlu Khan by cow vigilante groups. No problem. But should you not have remorse for those who came to kill them? They were Hindus. Do you accept that? That to kill one Pehlu, 20 Hindus have become murderers. You won't think about that either?!)" The discussion moved to how more and more of prime-time on television was being devoted to Hindu-Muslim issues rather than anything else and the same-same faces represented both sides. Rajdeep said he discovered that TRPs and his typical Muslim dress were the reason -- (Hyderabad MP Asaduddin) Owaisi has become the sole face of 20 crore Muslims (on television), someone who represents one constituency in Hyderabad... On one side Owasis and the other aapka dost Sambit Patra... In a 1.3 billion strong country, a country with diverse voices, on television we are constricted to battles between Owaisi and Patra?" Ravish dourly: "पांच बजे से टेलीविज़न का हाल देखो (Just look at what goes on on television from 5 pm onwards)." Rajdeep: "में तो देखता नहीं हूं! (I don't watch it!)" Ravish: "शाम को टीवी देखते है तो लगता हैं कि ओवैसी को सब्ज़ी खरीदने की जिम्मेदारी नहीं है। किसी भी विषय पर बैठा है (In the evenings when you watch television it seems like Owaisi has no other work, not even to go out and buy vegetables for his household. He is sitting there speaking on any issue)." Ravish brought up the Ayodhya issue and how the day Uttar Pradesh Chief Minister Ajay Singh Bisht announced Ayodhya would become a district, television channels went into overdrive playing up the issue. "मैं तो इसी बात से हैरान हूँ कि अयोध्या, जो ब्रह्माण्ड में जिसका स्पेस है, उसको एक जिले का दर्जा दे दिया (I am astonished that Ayodhya, which has a space in the universe, has been given the status of a district). Did you see the colour of the channels that day. And the bhasha (language)?" "ABP चैनल ने क्या चलाया था? फैज़ाबाद हरा रंग में लिखा हुआ। और फ़ैज़ाबाद धीरे धीरे dilute होता है। और फिर केसरिया में अयोध्या लिखा हुआ होता... यह क्या tonality है? आम आदमी नहीं समझते... हम और आप रंगों का खेल समझते है, इसके राजनीती को। ये कौन-सा खेल हो रहा है? (What did the ABP channel run that day? Faizabad was written in green and slowly it gets diluted and then Ayodhya is written in saffron. What is the tone of this stuff? The common man doesn't understand. But we understand this game of colours and its politics and what it means)." Even as news channels and other news outlets went all out to highlight controversial subjects that got eyeballs, other critical national matters, said both Rajdeep and Ravish, were deliberately missing from newspaper headlines, television bulletins or relegated to two-three line articles in inside pages. Rajdeep discovered that when he was in Mandsaur, central Madhya Pradesh, 75 percent of those he spoke to -- all graduates -- did know anything of the Rafale controversy (relating to India's purchase of 36 fighter aircraft for an estimated Rs 58,000 crores from France's Dassault Aviation). Ravish was not surprised. The Rafale story had not been published prominently enough or at all in many Hindi newspapers, he had discovered, like other news. Nor had anyone examined closely enough the accountability of Hindi newspapers, he said. Even former French president Francois Hollande's dramatic statement about the Rafale deal never made news while Finance Minister Arun Jaitley's denial in Parliament did. The same kind of snuffing out occurred, Ravish said, when then minister of state for external affairs M J Akbar -- he added wryly "वो अकबर तो महान नहीं रहे, अब यह भी नहीं रहे (Emperor Akbar is no longer considered great, nor is this Akbar now either)" -- was accused of sexual harassment. Ravish: "ये वह इंडिया है, सर, जो अपनी ही बिरादरी के लोगों की तकलीफ -- कहता बेटी बचाओ, बेटी पढ़ाओ नारा... -- वह महिला पत्रकारों (के बारे में न्यूज़) नहीं छाप रहा है... (This is that India, Sir, that does not care about the difficulties of its community of people -- they talk of Beti Bachao, Beti Padhao -- but they will not print news on what happens to women journalists)." He added later: "ये न्यूज़ चैनल अब देश के लोकतंत्रता से खेल रहे हैं (The news channels are playing with this country's democracy)." Rajdeep lamented that working as a journalist was once "a public service. We were in the media to make a difference. मीडिया एक तरह से entertainment का जरिया बन गया (In some ways the media has become just a form of entertainment). And I am a cinematographer!" And with reference to his audience -- the India public -- Rajdeep observed: "From citizens with rights, we have become bhakts who are robots to simply take orders from the top." Ravish: "यही हो गया है! (This is exactly what has happened!)." He went back to his refrain: "यही चीज़ लेके नार्मल नहीं होना है! (All this CANNOT become the norm!)" 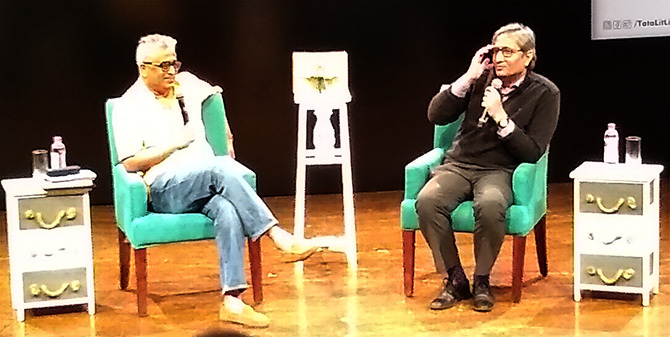 The Q and A session that followed with the audience was robust and even more noisy with Rajdeep and Ravish urging people to get informed on how their government was acting. Ravish's message: "जानिए! नज़र रखिये! बताइये! (Get informed! Keep an eye! Speak!) Tell as many people as you can." Param Laxman, a Mumbai student who attended the talk, felt, "The session was an eye opener. Mr Ravish speaks very well and has good impact because he knows what commoners such as myself feel." "What has been said this evening and what I believed my whole life: No government can be successful in a democracy unless it holds the interests of ALL its citizens along with careful planning and taking into account the social dynamics of the country," Laxman added. Signing his book, post the discussion, Ravish wrote in my copy of The Free Voice "Bolna hai! (Speak up)!"